I'm writing a new series for managers on oreilly.com. Here is a teaser for my first post! I was talking to a friend who was frustrated with one of her engineers. This engineer had a tendency to fall into some bad habits when stressed out, and my friend had given him a book to read on the topic, but he hadn't bothered to read it. Why not read the book, which would shortcut all of these conversations and corrections my friend needed to make over and over? I have even held reading groups for some of these, I wanted so much for my team to read them. I love to read, and I have grown to love books in the "self-help/business/leadership" genre. These books have taught me a ton, heck, I blogged my defense of the repetitive business book because I find so much value in them. They're great! Asking my team to read books has had mixed results. The most successful book I tried to get folks to read was Turn the Ship Around. I read it with my leadership team, and we would discuss it in our team meetings. It is a book that is so deeply applicable to the practice of managing engineering teams that I think it was easy for my team to appreciate its value. For most of the rest of the books, the people who were already interested in the topics read them, and the people who did not want to change what they were doing did not. Even when the doubters read them, they read them with a mind towards disagreeing with their message, and I'm not sure they got anything out of the books. This is not a fun lesson, but it is an important one for anyone who is managing a team. You can't force people to want to change. You can give them information, books, classes, coaching, but if they don't see a need to change, none of that will help. So the first thing you have to do, before giving them books, is to really convince them that they need to change. Ah, but this is tricky! Do they actually need to change? If they change, it will make your life easier. Will it make their life easier? Sometimes, we want people to change when in fact what needs to change is the situation we've put them in. If someone on your team is acting really negative, do they need to change their attitude? Or perhaps, do you need to move them to a team where they are not being ignored by their manager? Before you look to change the people, make sure that the change that needs to happen isn't in fact something in the environment that you can control. Most people are going to behave in unhealthy ways when they are in unhealthy environments. Asking someone to change the way they react to stress is a tall order. Sure, it would probably be good for them to chill out, be nicer, stop blaming others for their problems, but I've been working on my unhealthy reactions to stress for years and I know I still have a long way to go. Even when people want to change, personal change doesn't happen overnight. It is usually easier for a manager to change the environment than it is to change a person's reaction to that environment. 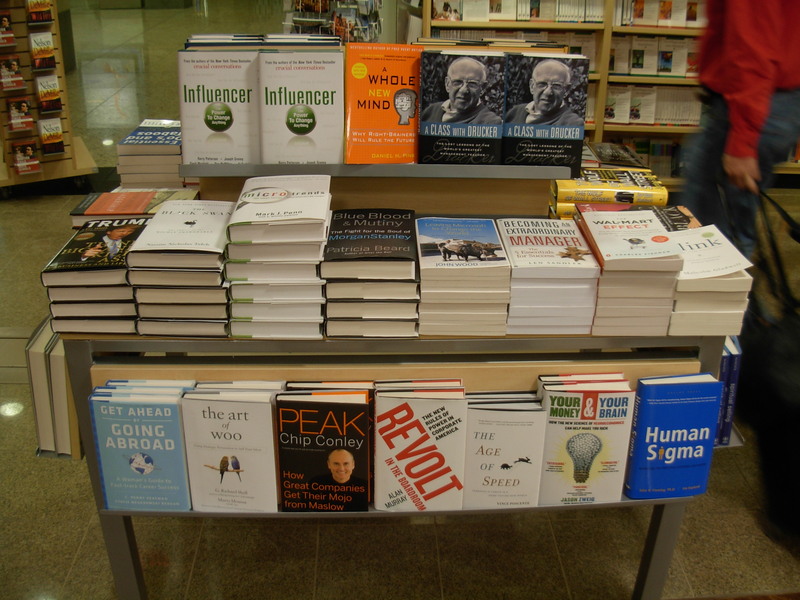 Looking back to my successful reading suggestions, they have almost all come when people had control over their environment, and the book was about helping them drive change in the team. It is pretty rare that I've given an unhappy person a book for reacting better to unhappy circumstances and seen them embrace it. Poor reactions to difficult situations can negatively impact the team and it's your job as a manager to help people identify these behavioral issues. Books can be great for this, but they are rarely going to shortcut the process of change. No matter what, don't forget to look at the circumstances that are triggering the behavior. It is unlikely that you'll coach your team to Buddha nature but you might be able to reduce the stress that is causing the problems in the first place, and that's a win for everyone. I'm a new manager, new to both the company I work for and to management. When I joined this company there were several fires for me to help put out, and every day I was busy dealing with one urgent task or another. But now I'm drifting. My boss doesn't have time to tell me what to do, I don't have any features that I am responsible for, and no one is urgently requesting my time. What is my job, now that things are no longer on fire? Ah, yes. One of the challenges of management that we don't often talk about is those times when you have no clear urgent tasks. Engineers deal with uncertainty in relatively bounded forms, such as, how should I break down this big project into smaller chunks, how should I architect this system, who should I talk to for information about this feature, what library should I choose? These are enough to stymie some, but usually by the time you've been working for a few years you know how to get started on these types of problems. Management, however, is a different beast. Management is like being in operations. Operations engineers must balance a series of ad hoc needs (system configurations or permission granting, say), with fires (outages), and long-term strategic projects (moving to a new data center, upgrading a major piece of critical infrastructure). As a manager you also have regular ad hoc needs (1-1s, meetings, small decisions) and fires (hiring, firing, projects in trouble, outages). And you have long-term strategic projects (planning for the team growth, thinking about the next quarter's goals, anticipating future obstacles). Like operations engineers, many managers get really good at the ad hoc and the fires, and really bad at the long-term strategic projects. It's much easier to do things right in front of you than it is to think abstractly about unclear topics. When faced with the blank slate of empty time and no obvious deliverables, what can a manager do to make the best use of that time? As a new manager to a new company, downtime is a good chance to learn the existing systems. Learning things that you aren't actually working on can be really challenging, so if it's feasible you might find small bugs to fix or minor improvements to build, things that aren't urgent (in case another fire crops up) but that will give you the feel for working in these systems. You can also use the downtime to meet with other teams that your team works with, learn about their projects and challenges, look at what they're busy with. Lend a hand to their managers, or help your boss fill that gap if they don't have one. At some point, though, you will have gotten comfortable with the teams, the code, the projects, and you'll still find yourself with downtime. This is the chance to flex your strategic thinking. Take a bigger-picture look. What are you not doing that is important, but not urgent? Maybe it's planning for reviews next month, setting up a team dinner, doing some proactive outreach to candidates you may want to hire in six months, or finishing that presentation that you have promised to give on testing but keep putting off. What are the recurring problems your team is having? What is not going smoothly? What could you be doing to resolve that? Remember, part of your job now is to define what work needs to be done. Your boss won't always be able to tell you what to do, and she probably expects you to tell her what needs to be done. Use this time to answer that question. Sometimes we put downtime to use in bad ways, and I don't mean procrastination. There are times when the best thing you can do with downtime is take a breath, check in on the internet, watch a talk you have been meaning to see. All of that is better than using downtime as an excuse to make work for other people, which can happen if you're not thoughtful. If you use your downtime to half-bake a feature and throw it into prod for your team to support, that is harmful. If you use your downtime to wander around and interrupt your engineers who are busy working, that is harmful (and yes, I'm guilty of that sometimes!). You are responsible for finding productive uses of downtime, and part of that is resisting the urge to meddle, micromanage, and distract your team just because you don't know what else to do. Is everything going ok? Are your teams productive, getting things done, working on the right stuff? Great! Use your time to think about the future, write a blog post, catch up on small unfinished errands. Don't worry, there will be another meeting, another fire soon enough. Enjoy it while it lasts.